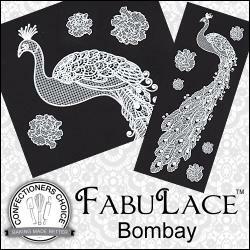 Set of three lightweight, plastic sheets to add intricate detail to your feathers using gumpaste or rolled fondant. Each mat has the same size repeated so several can be made at once. One side of mat will give a raised impression, while the other will give a recessed impression; use either side. Sized to make 4 5/8", 5 1/8" and 6 1/2" feathers. Use with Peacock Feather Cutter Set (sold separately). Mats can be used with gelatin also. How to use: Lightly spray texture mat with a cooking spray. Wipe off excess with a paper towel. 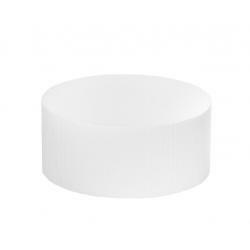 Roll fondant to approximately 1/8" thickness. Place texture mat on the fondant. Firmly roll over the mat. Remove mat. Cut textured fondant with peacock feather cutter. If a feather with frayed edges is desired, fray the ends after the feather is cut using a sharp paring knife. Color and shade with dusting powders.